People who know me know that I always enjoy a little history adventuring on the side when I go out to eat. And one of my favorite places here in Glendale is Parson's Restaurant, which is on Northern just west of 59th Avenue. If you've never been there, seen it, or even heard of it, it's not surprising, even though it's been there since the 1960s. It's not a trendy place, and frankly, it's just kind of, well, ordinary-looking. I've been going there for twenty years, and the customers there always struck me as people who were on their way to milk the cows, or harvest some corn, or something. It's as if you were walking into a coffee shop in rural Wisconsin or something. Plaid shirts, John Deere hats, that sort of thing. Working class. It's open from way before I'm ever up and around, until 2 pm, and it serves good, plain, solid, food. And the kind of non-trendy coffee I like. I'm a bacon-and-scrambled eggs kind'a guy, and I always order the home fries, which I call "lumpy potatoes"*. As my grandma always said, it's the kind of food that "sticks to your ribs". No, they don't pay me to stay this stuff, and I don't care. I'm just glad that they're there. I suppose living in the Phoenix area makes you nervous that any day a building might disappear. Parsons is owned by Alan Parsons, and has been since the 1980s. 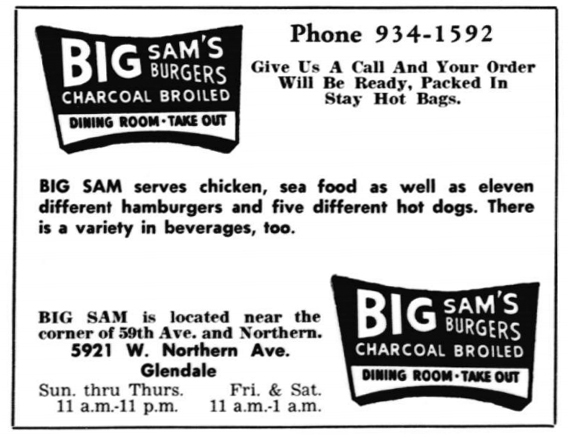 The restaurant was originally Big Sam's Burgers, and was presumably built to cater to the new college that was built in 1965, Glendale Community College, which is on 59th Avenue and Olive. 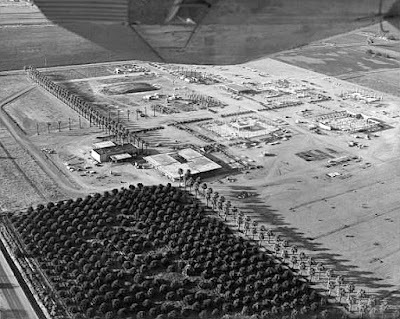 From the photos I've found of the area in the 1960s, it looks like there weren't a lot of choices for shopping and dining right nearby, so it probably got a lot of student business. Of course, it didn't take long for the area much closer to the college to grow, and my best guess is as the burger business started to slow down, the restaurant changed over to serving just breakfast and lunch. 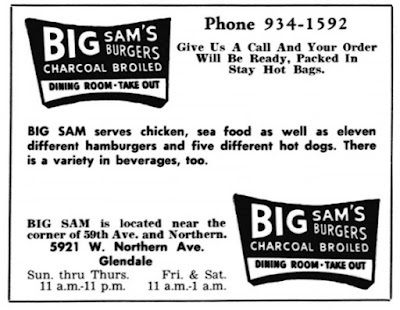 So, if you're planning on going there nowadays, don't select your menu items based on the old ad there, which is from the late 1960s. Of course, you can get a decent cheeseburger there, but if you show up late on Saturday night, you'll have to wait until the next morning for it to open. I love places like Parsons. And that's because I love living in a small town. Even when I lived in Los Angeles, I went to places like this, and made L.A. a small town. Dang, now I'm getting hungry for those lumpy potatoes! For those who are not familiar with Lumpy Potatoes, in restaurant terms those are "home fries"... and Parsons excels in fixing them. It's a favorite.